LoveToKnow had the opportunity to speak with expert Gary Daniel from Shenandoah Trunk Restoration about antique trunk restoration. Gary is an expert on restoring antique trunks and finding vintage and antique trunks. Gary Daniel has been interested in restoring trunks since he bought an old dome-top trunk at an antique auction. He spent time restoring it back to original condition so that it would fit in a Colonial style home. The Jenny Lind style trunk was significant and ended up being the oldest trunk Gary has ever worked on. It's also his favorite. Daniels completely restored the trunk inside and out, even hand embossing the leather with a historically appropriate design. Once the trunk was restored back to the original condition, Gary Daniels was hooked. He has been restoring trunks as a hobby for over two decades, and has spent the last eight years offering professional restoration services and restored trunks for sale. LTK: How do you go about restoring a trunk? GD: We estimate it from pictures that clients send through email. We evaluate it and note damage, prior restorations, rust, and other problems. The trunk is then sent to us and scheduled. Once it comes up in our schedule, we completely tear it down. We do any needed repairs and even replace artwork if necessary. Once the repairs are done, we build the trunk back up with new leather, buffed hardware, and original paint colors. W line the inside and whatever else it takes to get it back to the original condition. LTK: Is restoration ever a bad idea? GD: Restoration is a bad idea for museum pieces and rare trunks. 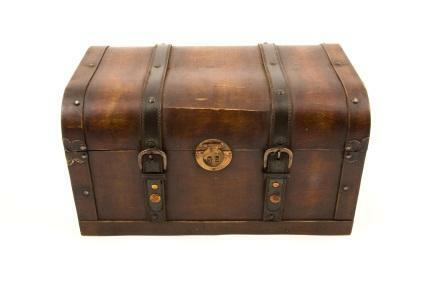 If you are going to use the trunk as décor in your home then it is better to restore it. It adds value and makes it more useful. LTK: Can a novice collector restore a trunk themselves? GD: Antique trunk restoration can be a very nice do-it-yourself project if you are so inclined. You can find books on how to do it and the Internet has all the supplies and parts you would need. It is hard work and can be a long process. Next, Gary shared tips on what to look for when buying antique and vintage trunks at auctions, yard sales and flea markets. LTK: What should a novice collector look for in an antique trunk? Always look for solid leather or leather covered trunks. Dome top leather or tin covered trunks are next in desirability. Finally, choose flat top canvas covered trunks. There should be no damage, minimal rust, and the leather should not be cracked or peeling. Check to ensure all the parts are present. Trays should be in place and check inside and out for rotting wood. LTK: What type of things affect the value of a trunk? GD: The value of a trunk today is affected by many things, including the maker's reputation, the age of the trunk, and the condition it is in when found. The better the condition and the rarer the trunk, the more it will be worth. LTK: Are some trunks rarer or more desirable than others? GD: There are some that are rarer, such as wall trunks that open while sitting against a wall. Other types of desirable trunks are the dresser trunks used by traveling entertainers, antique Louis Vuitton trunks, and very ornate Victorian trunks. LTK: What should someone who wants to buy an antique trunk avoid? GD: Collectors should be wary of trunk refinishers. Refinishers take the outer covering off, and stain and varnish the wood beneath. Most of the time the inside of the trunk is not lined with paper or fabric. All hardware is painted and most of the finished product looks identical to the next trunk that is refinished; the trunks are not restored to original condition. Shenandoah Trunk Restoration employs two trunk restoration craftsmen. It sells a complete line of trunk restoration supplies and parts as well as many other hardware items for antique restoration. The trunk restoration operation is located in Council Bluffs, Iowa just across the river from Omaha Nebraska. Shenandoah restores approximately 30 to 40 trunks every year, bringing them back to the original condition.